Building a home addition is often more practical than buying a new home, both from a cost and a convenience standpoint. Selling an old home and buying a new home is an expensive proposition, just in the real estate commission charges and state transfer taxes alone. Then there is the cost and disruption of moving, changing school districts, and leaving friends behind. So choosing to build a home addition for gaining more living space is frequently the path that homeowners choose. 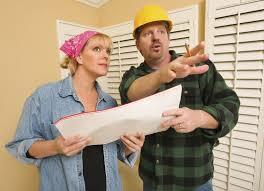 Hiring the right home addition contractor, however, is critical for ensuring a successful home construction project. Building a home addition is a major construction project and it imperative that you do your homework when seeking out and hiring a home addition contractor. To find home addition contractors to bid on your home addition plans talk with neighbors and friends to see if they can personally recommend one, and preferably one that they have used in the past. If you come up dry with this approach then use one of the companies that maintain a national database of home remodeling contractors. These companies fully vet out contractors prior to including them in their databases. To utilize one of these company’s services simply fill out one of their online forms, and 3 or 4 home addition contractors in your local area will contact you to schedule an onsite visit. There’s no cost to you for this service and you’re under no obligation to actually hire any of the home addition contractors that contact you. To search for a home addition contractor in your local area via one of these national database contractor companies go here. When interviewing prospective home addition contractors have your questions written down in advance. 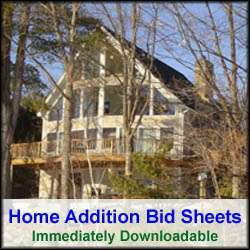 Alternatively you can use one of my “Home Addition Bid Sheet” questionnaire forms to interview your prospective home addition contractors. You can also simply give copies of the questionnaire form to the prospective home addition contractors to fill out and return to you. You can then compare the responses between the prospective contractors to determine which one is best for your home addition plans. During the interview process make sure, however, to ask several key background questions first. How many years of experience does the contractor have in the contracting field? Can they provide you with a list of references? Make sure to ask for recent and older references. This way you can check current work habits as well as how the home addition contractor’s work has stood the test of time. Are they licensed and registered with the state? If they pass all of these questions, by providing both verbal and written proof (e.g. copies of licenses, insurance, and reference lists) then move forward and ask questions specific to your home addition plans. How long will it take you to provide a bid on the project? Do you envision permits required with the town, city and/or state? Can you estimate when you can start the project? How long do you estimate to complete the project once started? Will you use and subcontractors? Do you provide any warranties, and if so do you put the warranties in writing? Will you break out your bid proposal in terms of materials and labor? Were the references happy with the construction of their home addition? Did the home addition contractor complete the work on time and budget? Were their surprise cost charges at the end of the project? How did the home addition contractor respond to changes in the plans during the construction? Would use the home addition contractor again? Would you recommend the home addition contractor to your friends and family? By following these simple guidelines and asking the above questions you can significantly improve your chances of hiring the right home addition contractor and having a successful home construction project that is completed on time and budget.